Team USA's new coach discusses his plan for making America great again. 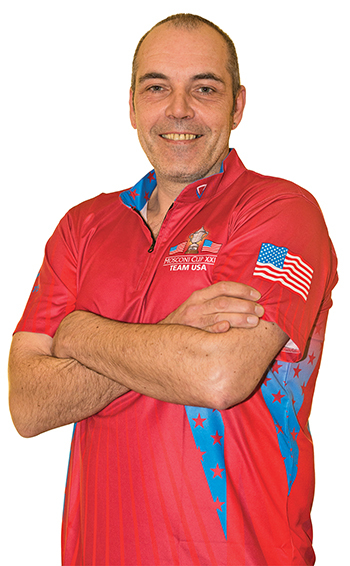 The appointment of Dutch coach Johan Ruijsink to the helm of Team USA for the 2017 Mosconi Cup took the American billiard community by surprise. Few American pool fans know much about the 50-year-old Ruijsink. And more than a few players and fans raised an eyebrow at the thought of a foreigner captaining Team USA. Surely, promoter Matchroom Sport had its reasons for selecting Ruijsink. For starters, he is the most successful captain in Mosconi Cup history. Ruijsink was undefeated in seven trips to the Mosconi Cup as the captain of Team Europe. He stepped down after the 2014 Cup and has spent the past two years coaching Russia’s impressive crop of young players for the Russian Billiard Federation. Ironically, Ruijsink was with his Russian charges at the 2017 Derby City Classic in southern Indiana in January when his appointment was announced by Mosconi Cup promoter Matchroom Sport. The timing allowed Ruijsink to hold face-to-face meetings with several of the top U.S. players. 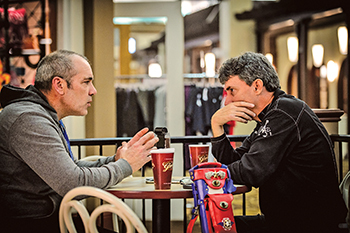 The timing also allowed Billiards Digest publisher Mike Panozzo an opportunity to sit down with Ruijsink and discuss his new role and his hopes for Team USA in 2017. Were you surprised when Matchroom contacted you about taking over Team USA? I was initially surprised. It was obvious that Team USA needs some help. 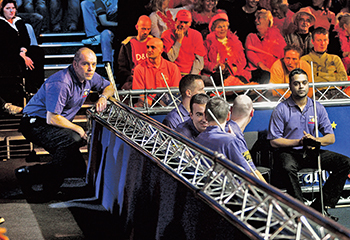 They don’t need help as players, but the Mosconi Cup format has just gotten them to not play as well as they can. I had been thinking about it a little, but switching from European captain to U.S. captain seemed like a weird thing to do. Still, bringing someone in from outside is more accepted in sports today, so I knew it was possible. I was surprised that Matchroom was willing to make that change, but I was not surprised that they called me as an expert to discuss how to make Team USA more competitive. Talent-wise and quality-wise Europe is incredibly strong, but if Team USA plays its best, the matches could be very different. It won’t be easy, but they should be competitive enough to put pressure on Team Europe, and that is what we need to do. Pressure changes everything. Everyone has a breaking point. Even the best players. Not at all. They wanted me and I wanted the job. Allowing for the appropriate amount of time to prepare Team USA for the event was the key discussion point. I plan on coming back to America three times for seven to 10 days. I know I will come back in July and August to look at players. I still have to figure out if we will get all the players together or if I will go see them individually. I would love to work with them as a group, because we need some team-building and development of trust. Then I will come back a fourth time for the big lead-up to the Mosconi Cup. What is the length of your contract with Matchroom? My contract is one year at a time. That’s what I have always had. I want to be judged on my results, and I’m confident with that. What kind of leeway will you have in the selection of the team? I will get to select all five players, as long as they are in the top 10 in ranking. I will also select one or two wildcard additions, because I would like to start the process with six or more players. If someone doesn’t fit in, or doesn’t adjust well to the system, you have to be ready to replace him. It’s not personal. It’s all about Team USA. This isn’t kindergarten. This is top-level sports and we have to find that team that gives the U.S. the best chance to win. You must have a decent idea of the players you will keep an eye on. The backbone of the team isn’t hard to figure out, but there are five or six players that could be in the hunt for the other spots. Some of the things I will watch will be what direction the players take in their pool life. Are they playing exclusively money matches? Are they playing exclusively bar table events? Playing internationally is important. Have you already talked to a number of players and spelled out those expectations? Yes. I have talked to a few players, but I will talk to more. It’s not all up to me. I understand that players will play in one-pocket tournaments because the pool world is about more than the Mosconi Cup. It’s about survival. What was the reaction of the players? All the players were very receptive to my being captain. The toughest nut to crack will be Shane. I hope in the end he will come to trust me. He is America’s best player, but in the Mosconi Cup he should be just one of five players. I think in the past there has been too much pressure on him to carry the team. If he just plays like he can, it will be a joy to watch. Your decision to step down from Team Europe was based on what? My decision was based on a couple of things. I had stopped my job with the Dutch Billiard Federation. I felt that the players needed to have someone there all year long, seeing their matches, seeing their tournaments. I wasn’t able to do that anymore. Also, my character is that I don’t like to work the same cycle for a long time. I need new challenges. I like to be inspirational, which gets harder and harder if you have done the same thing too many times. Everything has an end. We had perfected the system that I put in at the beginning. The players were mostly the same, so they already knew what to do. There was no real challenge anymore. The system is the thing that is used in all sports — discipline, being ready to compete, team building. These are simple things for sports, but they didn’t seem to be in place for pool, especially the preparation part. Players just showed up for the Mosconi one day before the tournament, hit some balls on the practice table and that was it. But we practiced technically. We talked about things like who should play who and which player should follow which opponent in doubles, how to play short races, how to handle a specific break, how play is affected on new cloth and TV lights. Pool players play on lots of different materials and conditions, so they adapt very quickly, but you do need to prepare them to adjust to the task ahead. Team bonding is very important, because these players spend the whole year chasing each other’s money. You have to get them to lose that mentality for five days, otherwise there is mistrust. You need 100 percent trust for five days. You noticed that after the players had been through the Mosconi Cup team event, they were better friends after in the other tournaments as well. What has occupied your time over the past two years? I took a little sabbatical. I didn’t have a coaching job after 2014, so I started a cleaning business, which I had done before. I wasn’t on social media and I didn’t really stay connected with the players much, but I watched pool to stay in touch. When Mark Wilson was put in charge of Team USA, I thought he was doing things the right way. He started with fresh, young players. I was very hopeful. I was surprised it didn’t work. I watched every match of the Mosconi Cup the last two years. All of the matches and shots are engraved in my memory. I looked for the things that are important to me as a coach. Systems are important. There are key matches, and I watch for the things that swing those matches one way or another. You have to work within a process. I look for those things. I didn’t do that planning to coach Team USA. It is just the way I observe the sport. You have also been coaching the Russian men and women. How did that come about? I had been to Russia in 2007 to develop some boot camps to get Russian players ready for the European Championships and the Eurotour. They were very nice to me so I kept doing that. After a while the federation there thought it would be a good idea for me to coach the Russian players full time. It has been a pleasure, because they are big talents and eager to learn. They want to push forward in pool. There are a few star players — Konstantin Stepanov and Ruslan Chinakov — and there are some very talented young players — Fedor Gorst, Maxim Dudanets, Andrey Seroshtan and Evgeny Stalev. The ladies are also at a very high level in pool. In 2016 I was there for eight weeks at a time. It’s hard work and that is a long time to be away from home, especially since it was during my children’s summer holiday. I worked with 10 players. Some of them would be off at tournaments during that time, so in the future I will work with them for two-week sessions. Thinking back to your first Mosconi Cup, what is the most noticeable difference between Team USA then and Team USA now? The big difference is confidence. When I started in 2006 my first task was to get the players to develop confidence. At the time, Earl and Rodney were unbeaten playing doubles, so that was our first task. You have to start taking down the walls. I already believed that the European players were just as talented. Europe was down, 10-2, in overall score then and that didn’t seem right. Just like now, Team USA losing seven in a row doesn’t seem right. What is your general overview of potential team make-up? Honestly, it will be difficult for the older generation to make the team. When you have lost seven times in a row, it’s harder to have the right mindset. I saw that with Team Europe when I first started. I would like to work with the players technically, but have no intention of trying to change their game. It’s just a matter of getting them to do their job at the table. They have to play their game at the sharpest. I can’t change the system and I can’t change the players. I can only give them tips and pointers on where and how to focus on the job at hand. If someone needs to improve their kicking game, that’s what we work on. There are a lot of instances in which push outs and safeties decide the game. The lag is very important. I have been at Mosconi Cups where we have had 10 or more hill-hill matches. Having that final break is critical. What is your general assessment of US players right now? The biggest difference right now is the culture of pool in the U.S. This country protects its spot in the sports world in basketball and football and baseball, but not in pool. All the other countries have treated pool differently. They have brought in education and training and treat pool as a sport. They have educated the players to be tournament players first, not money players first. It’s not that way in the U.S. Players here are on the road gambling when they are 13. I think that hurts your game. I think technique and the process are critical in the early stages. Technique is the most important thing in the sport. If you can only reach 80 percent of perfect in your technique, you will never achieve 100 percent in your results. If results are all you look for at 13, you’ll never hit that 100 percent potential because your early focus wasn’t on technique. Eventually, your flaws will prevent you from reaching 100 percent. There was a fair amount of negative reaction on social media to your appointment. How did that affect you? First, everyone has his own character type. Mine is that I don’t really focus on, or care about, what other people think of me. The people who judge me don’t know me. I care about my direct environment and how I feel when I look in the mirror. I do some things well and some things not, but I always try to improve. One of the arguments is that the U.S. players are in a can’t-win situation. If they lose, it will be because the players aren’t good enough. If they win, you will get credit as Team USA’s savior. How do you look at that? And do you feel like you got too much credit for Europe’s success? At the beginning there was no discussion about my impact. That came after the wins started piling up. Then people started giving me praise. And they are right, I did some things right. But in the end it is the players who win or lose. I try to get them prepared and make them comfortable, but there is only so much I can do. If I can get them to play two percent better, that can make an impact on the score. Still, it’s up to the players. I’m glad that people are involved and have taken so much interest in Team USA. But don’t judge me on my nationality. This is the way it is. I’ve been appointed as captain. Keep rooting for your team. And if America wins the Mosocni Cup, it will be five U.S. players who win the Cup. You have already selected Johnny Archer to be vice-captain in the event he doesn’t make the team as a player. What does he bring to the team that is of importance to you? Johnny is everything that I’m not. He’s emotional. He’s driven. He has knowledge on the table. He understands the pressure of the Mosconi Cup. He has been in all of the team’s wins. And I need a connection to the American pool community. In the end, what are your expectations? Expectation is the model of failure. I don’t expect anything. Preparation is the model of success. My team will be ready, trustworthy towards each other and will stick to the agreements that we make. From there everything is a bonus from a good process. Lifestyle and fitness is important to you, why? If you are in shape you can practice more and harder. You can handle disappointment better. And you have confidence. When Thorsten [Hohmann] and Niels [Feijen] work out and stay strong, it gives them confidence. It’s about discipline. It keeps you in good mental shape too. There are so many random factors in pool. Any factors you can control, you need to control. Once you get into the arenas, how will you be able to separate yourself from your past as Team Europe captain? Anyone who thinks that making that separation is hard doesn’t know much about pro sports. In pro sports, the battle starts as soon as the game starts. From that point on you want to destroy your opponent. Afterwards you can be respectful and friendly. This is competition and winning. If Team Europe plays bad, that’s their issue. During the match there will be no pity. Yes, or I wouldn’t be here. We will be ready, and that is the most important thing.